This magnificent Tibetan 'chuba', or 'ji fu' (auspicious cloth), was tailored from 18th century Chinese 'kesi' (or woven tapestry) silk brocade probably woven in the Cloud Brocade Institute in Nanjing. During the Yuan, Ming and Qing dynasties, successive Mongol, Chinese and Manchu emperors patronised important Tibetan Buddhist monasteries and abbots with lavish gifts, including silks. As Tibetans did not produce silk, they particularly welcomed such gifts of luxurious silk textiles from the Chinese court. These gifts were then re-tailored in Tibetan styles or re-used to decorate temple buildings. Until the present century, many of the leading Tibetan Buddhist lamas such as the Dalai and Panchen Lamas would wear elaborately decorated 'chuba' on state occasions. 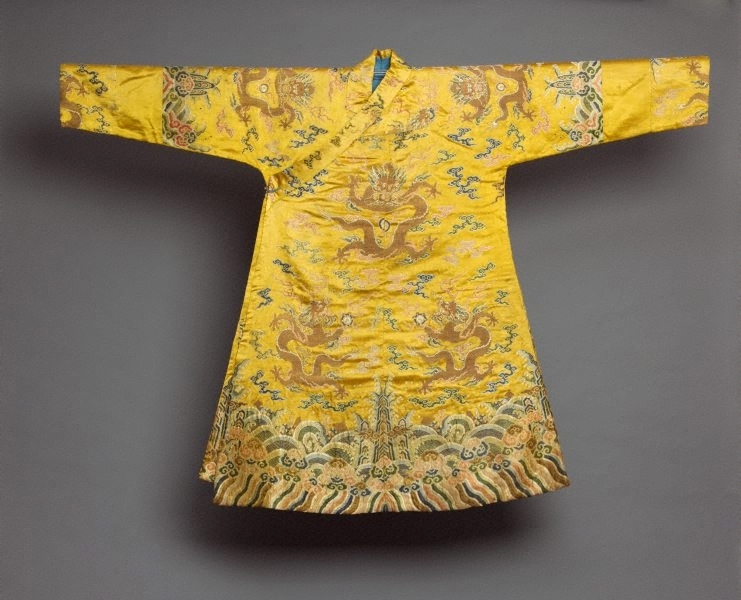 This robe features eight five-claw dragons, three on the front, three on the back, and one on each sleeve. The creatures float in the cosmic setting represented by the mountains (the earth), waves (the sea), and the clouds (the sky). The five colours of the auspicious clouds, white, blue, black, red and yellow represent the five elements of Metal, Wood, Water, Fire and Earth in the Chinese philosophy of the universe.